Discussion in 'Other Skills' started by OldMan, Dec 8, 2017. Okay, just about any type project starts with a blank something. Want a spoon? It starts with a piece of wood and you use your tools to take away bits of wood a little at a time until the spoon appears. Oversimplified? Sure it is but hey I'm old and demented and besides it's my thread and I can do pretty much what I want with it. Must be true, pretty sure I read it on the internet somewhere so it has to be true. Okay, down to business. This here's sort of a work-in-progress type of thing. It's not so much a 'how to' as it is a 'yes you can do it too'. Later on I'll do some actual tutorials but this is to demonstrate that, somewhat like the spoon carving, you start with a blank page and take away the empty space until you have something that you want. You can also say you add to the page to fill in that space and that's true too but I like to look at it as taking away the blank space the same way we take a bit of wood off the log to carve something, same way that a leather worker takes material off the hide to create, I like to envision it as taking away all that mass of blankness until we're left with something. For just about anyone a blank page is daunting. Even if you're reasonably sure of your skills (and that's what drawing is, a learned skill) it can make you nervous. Will I be able to do it? Can I fill that expanse? Will what I want to do have too little detail? Too much detail? It goes on and on. Quite frankly many will give up at the start. I know I did over and over for a long time. I first got one of those big 12 x 15 sketch pads and the first time I went to use it I was like holy crap what am I going to do with this huge page of emptiness? This is why I suggest smaller pads or sketchbooks to start with. Smaller mass of emptiness is easier to deal with. Okay so today is the 8th of December. I've been trying to get started on this piece since just before Thanksgiving. I had two commissions to do and a difficult customer so ended up having to do two paintings over again twice due to changes they'd made and that was rather time consuming. This one is for fun but also for a special little person and let's face it, we do what we do for fun and the smiles so how about I stop rambling and get on with it. Note: Apologies in advance for poor image quality. Lighting conditions weren't great in doing this and most of the time I was doing the actual drawing with the aid of my head lamp the same as when I'm in camp in the woods. I was also part way into the project before I thought of posting the process and started taking pictures. For those interested in the materials used it's: Strathmore 500 series watercolor paper cut to 5x7; kneadable eraser, and a Sanford 2mm drawing pencil with a 2H lead inserted. 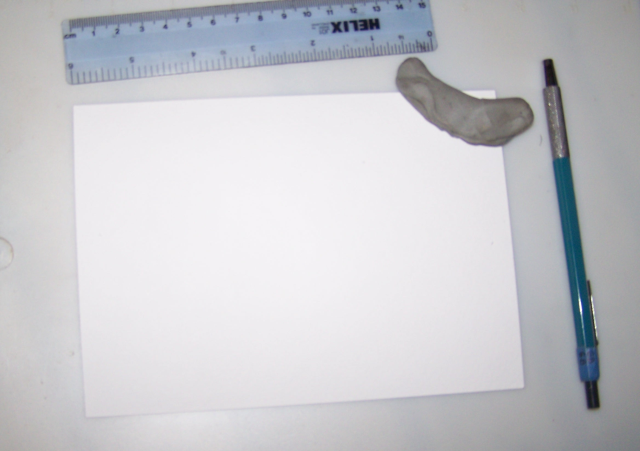 The ruler will be used as a hand rest overtop the drawing to prevent smearing of the graphite on the page. What we want is to take away that blank space and add something fun. 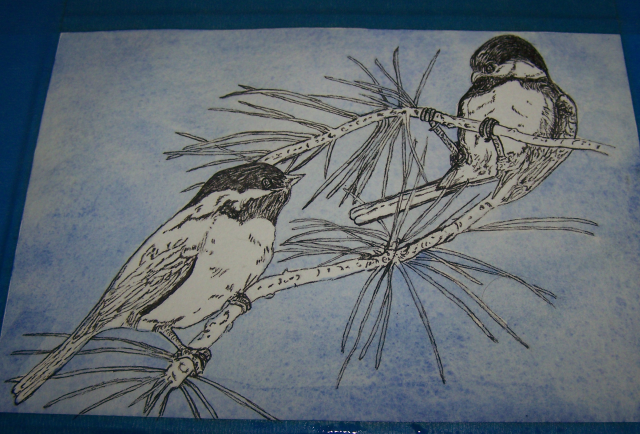 In this case I'll be attempting to add a little bit of forest fun, namely a couple birds. Being stuck in the city for a while and grumbling constantly about it, I'll be using a reference picture rather than observing the birds in the field. Before I commit to ink and paint I want to sketch/draw the image lightly in pencil to give myself some guidelines and to ensure I fit the piece into the paper. I also don't want the paper sliding about and since we'll be adding some watercolor to it later on I chose to use tape instead of binder clips. Material is 3M Scotch brand painters tape. Some say it's not as good as drafting tape or artists tape but it works for me, you just need to be careful when removing it so the paper doesn't tear. It's also far far better than regular masking tape (which for paper is as bad as duct tape the majority of the time). blind & lost, gohammergo, BalsamFur and 18 others like this. Now it's time to put the pencil to work to sketch out the desired image. Even though the 2H lead is rather light and light pressure is being used, the kneadable eraser will help lift excess graphite off the page. In the prevous post's second photo you'll see how faint the lines are. Here's the penciled image at a different angle and lower light. Okay, with the basic shapes penciled in it's time to take a deep breath and go for the ink. For this today I'm using a Uniball Micro 0.5mm tip roller ball. In addition I'm also using a Micron 005 drawing pen with a 0.2mm super fine tip for some detail areas. 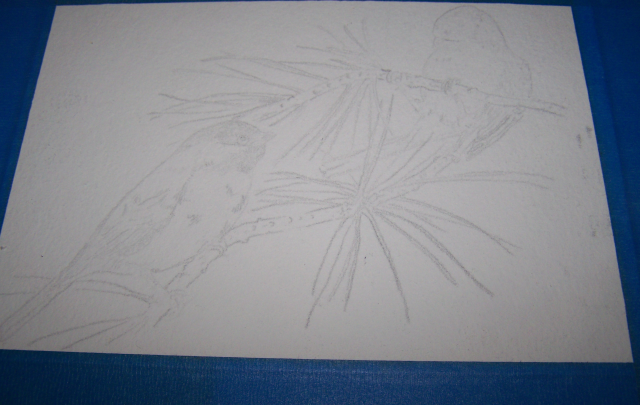 Quite frankly I goofed a bit in doing the drawing as I drew the pine needles as lines. 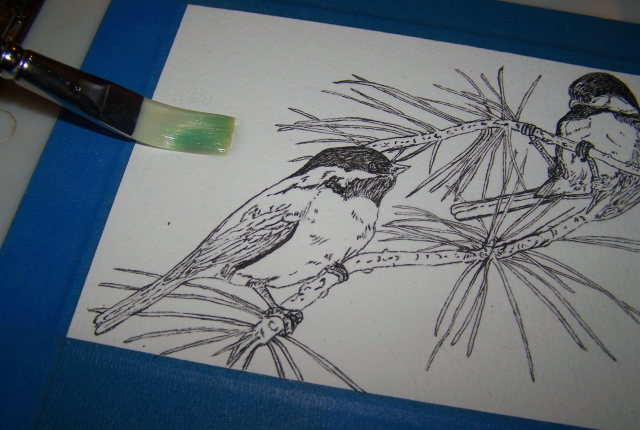 That's fine for a black & white drawing but as I intend to add color to this I had to correct my mistake by using finer lines around the pine needles so there's room to add in the color. 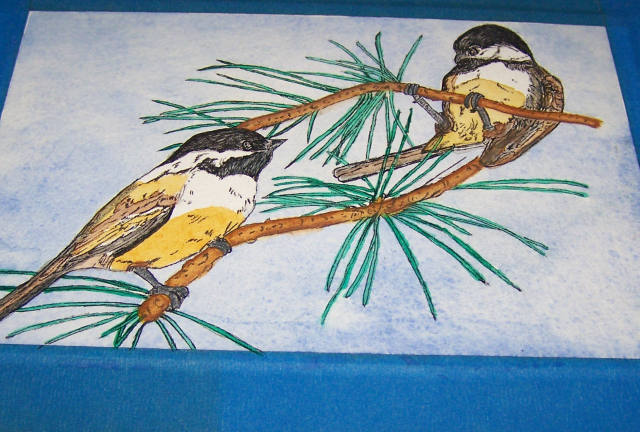 Quite frankly the needles on the branch were more frustrating than doing the bird on the lower left. Adding in the lines, curves and hatching for the bird feathers was actually easier and since it's short repeated strokes the texturing was also rather fun to do. Continuing onward, taking away from the blank space, adding in additional pine needles because being all hardwoods here it was fun to do. A little more detail before the color (more will be added later), and we're well on our way. Well, here's the stopping point for now. The basic work is done and am looking forward to adding some color to this over the weekend. Really hoping to be done with this and into Santa's hands for delivery to it's place under a little one's tree in time for Christmas. Huey, happywanderer, Zunga and 40 others like this. blind & lost, Beach Hiker, central joe and 2 others like this. Thank you! It's a little gift and at some point I realized that it might be fun to show the process of it in the making. Oddly I'm more nervous about completing this one than I was with the two large canvas projects I just completed. Right now I just figure if I can't be in nature I'll create some and it just feels good to do. Quinlan, blind & lost, gohammergo and 10 others like this. That's awesome @OldMan ! My illustration skills peaked at around 12 years old, but it's obvious that you've been refining yours for a long time. blind & lost, gohammergo, Beach Hiker and 4 others like this. By age 12 I'd failed every art class in elementary school. I was in my 30's before I really got into doing anything again. It all started when I was made to wait while girlfriend and her mom browsed through flower crafting stuff and I was bored stiff so moseyed over to the art supplies section to gawk and awe at the stuff there and the cool pictures on some of the art packs and then grimaced at the 'how to' art books. That's when I discovered on the bottom of a nearby shelf what made the change. It was sitting on a pile of drawing pads by itself, and assumed a careless shopper just left it there. It was about 6 x 9 and landscape format which was weird to me at the time. It was titled "How to Sketch" and originally published in the late 60's or thereabouts. Now, at the time I just figured sketching was a fancy word for drawing but it got my attention. Somewhere about the first couple of pages and after the dedication the author's words hit me like a Peterbuilt versus an armadillo on the I-20. I paraphrase it like this, "This isn't about drawing. A Drawing is a finished work, often painstakingly rendered to achieve the best form. This isn't about that. This is about sketching. Sketching exists before the drawing. It's a fast simple marking of the paper into an image to render an idea. If you can make a mark on a piece of paper you can sketch. Here's how..."
Again, not the exact words. That little book was lost sometime around hurricane Charlie and it was well used, pages falling out and very much dog eared. I've missed it since it was lost and have yet to find a replacement. Heck, I can't even remember the author and it's likely a reprint won't have the same raw sienna colored cover. I found a PDF copy of a similar book of similar cover and similar content but it's not the same book as I once had that inspired me to give art a try. In the Legion when being observer, spotter, or sniper we had to sketch out the area and note range and landmarks but I pretty much sucked at it and whenever I could I'd get one of the other guys to do the drawing. Primordial, blind & lost, gohammergo and 11 others like this. I do. I do sell them, though it's usually finished pieces and don't often take commissions. It's definitely more fun than collecting aluminum cans along the roadways for extra cash. I've done some natural clay pipes fired in a camp fire instead of a kiln and some carvings but I got frustrated. I'd try for my best work but the froo froo people want the more primitive stuff rather than the well sanded stuff as to them it looks more rustic and hillbilly than an actual finished piece. As for the art work, people sketching and painting tend to attract onlookers just over the shoulder. When I'm in town I like to find a spot and sketch the surroundings (KC has a lot of fountains to sketch) and even when sketching at a park sometimes people will notice and come around to view and talk and ask questions. I used to just show my finished works and some sketchbooks but after being asked multiple times if anything was for sale I started doing some things specific for selling. I don't sell much but that's fine. It helps pay for the art supplies to create more so that all works out for me since the budget is seriously tight for everything else. blind & lost, gohammergo, GoKartz and 10 others like this. blind & lost, gohammergo, Beach Hiker and 3 others like this. @OldMan I have always wished to draw/sketch. I am limited to stick people, and carrot-top trees! blind & lost, gohammergo, OldMan and 4 others like this. A pristine blank page or canvas is so intimidating. For holidays and special occasions I like to give art supplies to nephews and nieces and include a nice hardcover sketchbook. The pens, pencils, markers and paints all get used, the sketchbooks do not. Their wonderful art is produced on old homework pages, junk mail envelopes, food stained paper placemats from restaurants and scraps of cardboard. Making that first mark in a brand new sketchbook even for older children is intimidating. Looking forward to more posts on this project! blind & lost, gohammergo, OldMan and 5 others like this. .very cool and interesting. Art can come in many forms but I seriously lack in this one. Thanks for sharing your process. blind & lost, OldMan, Hoof and 4 others like this. blind & lost, OldMan, Hoof and 1 other person like this. blind & lost, gohammergo, OldMan and 2 others like this. blind & lost, gohammergo, OldMan and 1 other person like this. Love this thread Old Man! blind & lost, OldMan and Hoof like this. I took an Art Class in high school and one Art Class in college. I wanted to be able to do it but I have NO talent in Art. I enjoy Art but I just cannot draw. Thank you!! Yeah, blank page, especially the first page in a sketchbook or the first page in a written journal is very intimidating and hard to deal with (and I've been journaling since I was in in elementary school). We get this idea in our heads of perfectly hand written entries in flawless script that can be handed down to future generations or used in future documentaries about the times we live in. Likewise for a sketchbook we imagine perfectly done drawings and artwork in page after magnificently done page. Then we realize we're not that good or don't write that well and our penmanship intimidates doctors' prescription pads. What I do is write return info in the cover then a short note on the first page. Second page I force myself to do practice of lines and circles then on to geometric shapes. Once that's done the perfection aspect is out the window so it's okay to go on and just do what you'd usually do. Thank you! Much appreciated but talent doesn't really figure into it. I mean, I don't think I'm talented at all but thank you so very much for your compliment! My cousin six weeks my junior has the real artistic talent, getting professional commissions while still in high school. For myself I had to learn to sketch the same as I learned how to do feather sticks, carve a spoon, wire electronics, design a communications system, make a thousand yard shot, or deal with explosives. It's a learned skill and after learning the skills that's when any talent enters and for me personally, there's very little of that as far as I'm concerned, especially when I compare myself to "real" contemporary artists like Cathy Johnson, David Gregory and Peter Sheeler. Thank you for your kindness. You're welcome to do so! I just wish I had been able to get better quality photo images. I used to be very VERY much the same. Failed art in elementary school and in junior high and high school when art classes were offered I was so dejected by my experience that I took home economics and electronics instead. 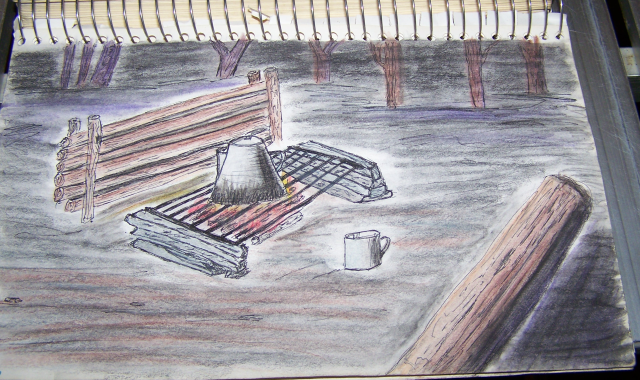 Sketching is a skill that is learned, same as any other skill we use in bushcraft. I'm not kidding, it really is. Hand a knife to someone who's never used one and ask them to create a spoon and a bowl and I guarantee you that no matter how much innate talent for carving they might have, it will not look pristine when completed until they learn the skills necessary. I hear you and understand you completely. For ages I felt the same way. It really wasn't until later in life that I finally understood that it's a skill to be learned and that I'd never had those skills taught to me that I began to improve. Thanks EVERYONE for your responses. I was shocked when I logged in today to discover 184 alerts waiting for me. Y'all are wonderful! Zaveral, blind & lost, GreySwampFox and 3 others like this. 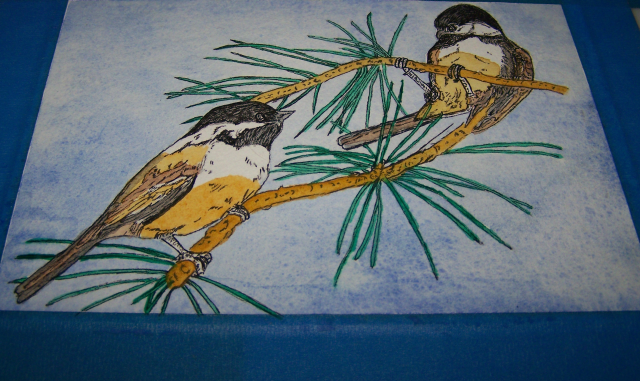 You did great work on those chickadees. And it is so true that it is a learned skill - it gets better with practice, and gets worse when you neglect it. Honestly, I think the skill is more of learning how to see than anything else, but that's just my opinion. OldMan, blind & lost, GreySwampFox and 1 other person like this. My drawingenthusiasm ended when I left high school. I was quite good at it, but it just.... went. These days blank pages daunt me in other ways. I have taken to writing. And what I do now is looking to turn into a trilogi. And that for a first time! I must be stark raving mad. OldMan, blind & lost and GoKartz like this. As said before this isn't so much a 'how to' as a "you can do it too" showing the work in progress. The steps I take tend to vary from one piece to another and so does the order of what to do first, next, and so on. I do tend to work from lighter to darker most of the time but as you'll see here I do move through to the darker colors early in some parts and then switch between colors as I do other parts. That's one of the fun things about doing this. You choose how you want to do it and in what order. There is no real hard and fast rule, and you'll also likely see in the process that there's more of this "mixed media" piece than just ink and watercolor. By the way, that technical term can sound confusing to the novice same as the term "feather stick" because we're not really turning the wood into feathers, just curls. Mixed media means that more than one type of media is being used, whether that's ink and watercolor, ink and colored pencil, colored pencil and watercolor, or a mix of colored pencil, watercolor, graphite pencil and ink. Anyway, here's to the continuation of the project. 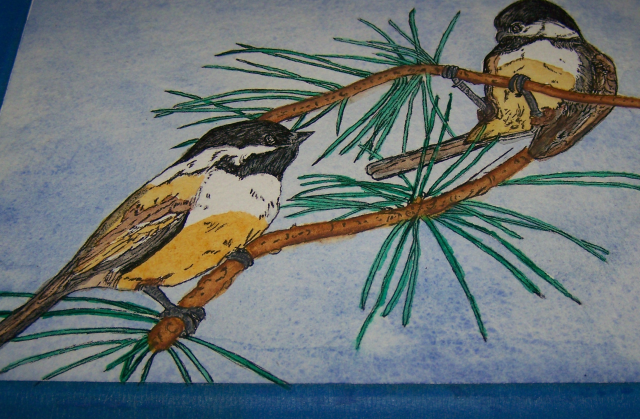 Thought long and hard about whether to do a background for this as the chickadees are the focal point. Then I decided that plain white was just too plain white and decided to do a background in blue, yet varied not completely solid. The bulk of the painting work is done in dry format, meaning wet paint onto dry paper. For the background I'm doing a 'wet in wet' type of technique where the paper is saturated with plain water and the color allowed to flow with the water and texture of the paper. Materials for this part: Plain water and a 1/2" flat brush (long). It's called long because the bristles are much longer than normal length. It's not necessary for this step but it's the only 1/2" flat I have with me right now and it's not a problem. The bristles are white but as you can see in the photo they've become discolored with much use. That's not an issue as the brush is clean. 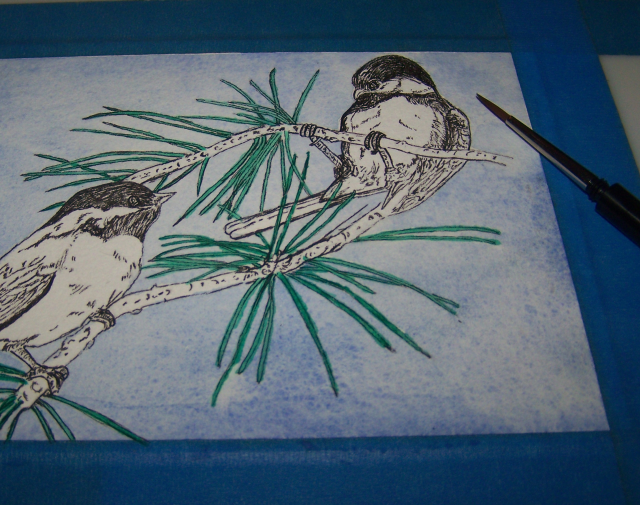 With the paper saturated and wet it's time to apply the color. I'm using Winsor & Newton Ultramarine Blue for this. I chose this over a lighter Cerulean blue as once I've gotten some pigment onto the pallet for mixing I can strengthen or dilute it at will, and am also looking for more of a late afternoon fall/winter appearance. There's an old saying that an artist has to suffer for their work but I'm not about to cut off an ear so instead I'll use the same half inch brush to do the background, using the corners and edge of the brush for the tight areas. MommaJ, bacpacjac, GoKartz and 1 other person like this. Now we have the background filled in. We don't need sky with clouds or sunshine, just to be non-white and something other than solid. As you can see the blue flowed through the texture of the saturated paper and by varying the amount of pigment and water dilution on the mixing pallet we've got a nice varied gradient throughout that (hopefully) draws attention to the sketch in the center. Now it's time for the hardest part of all....waiting for it to dry. Because the rest of the color will be applied with the wet brush into dry paper we'll need to wait for the piece to dry completely before continuing. happywanderer, Primordial, MommaJ and 3 others like this. Wow! 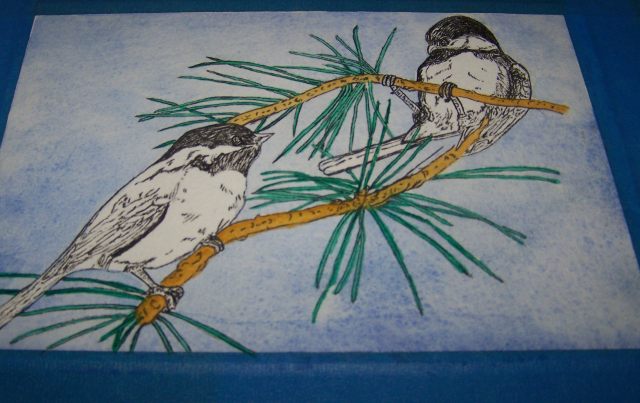 I liked it before but that background really makes the chickadees pop. It's beautiful! Putting the colour on after the drawing would intimidate the heck out of me! OldMan and NWPrimate like this. While waiting for the page to dry I think a bit of visual aid might help with the description of getting the pigment on the pallet of the mixing tray and diluting it. Here's one square of my "at camp/at home" pallet tray. The glob on the lower left is the Ultramarine Blue. You'll also see where I've used paint from the tubes and applied it directly to the pallet for use. Fun thing about watercolor paints is they dry and can be used again later. Paints from the tubes can be applied to the pallet like this or used to refill half pans or full pans inside paint boxes to make them more portable. Upper left is Sap Green, Upper right is Burnt Sienna; lower right is sepia and lower left is, again, the Ultramarine Blue. 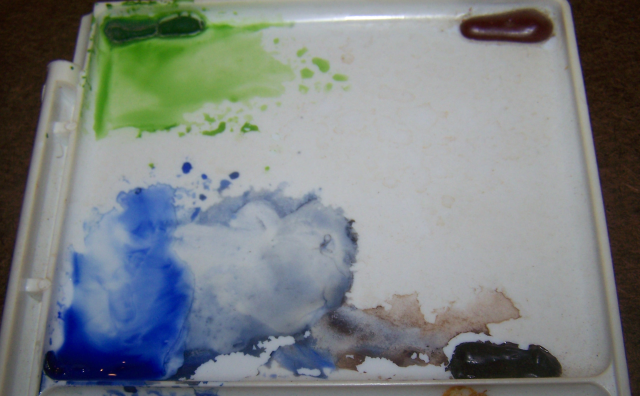 Pigment is leftover on the pallet from previous mixings and left to dry. It's messy but the pigments can be activated again just by getting them wet so a small tube can go a long long way. Often when looking at a watercolorist's paint pallet you'll see it looking like this with splotches of mixed color everywhere. Professional grade paints can be expensive and oft mixed colors are likely to be left to dry and reactivated later rather than "cleaning up the pallet" with a damp paper towel. Here you'll see where I've wetted down and drawn out some of the ultramarine blue into darker and lighter portions and this is what I used for the background. Towards the lower center you'll see where I've mixed some of the ultramarine blue with sepia to make a darker blue, a gray, and a brownish gray. These mixings were used later in the painting when doing the feathers on the birds. happywanderer, GoKartz, bacpacjac and 3 others like this. Try it, you'll enjoy it, trust me. Use a page from one of the kid's coloring books and attempt to duplicate it in pencil, then go over the pencil in ink. From there color it in with colored pencil or watercolor just like you're coloring in the coloring book. It's one of the reasons I love the so called 'urban sketching style" of sketching first then coloring it in. I'm a grown up but get to color in my own created coloring books. happywanderer, GoKartz, bacpacjac and 1 other person like this. Okay, I mentioned in the first posts about the narrowness of the pine needles. 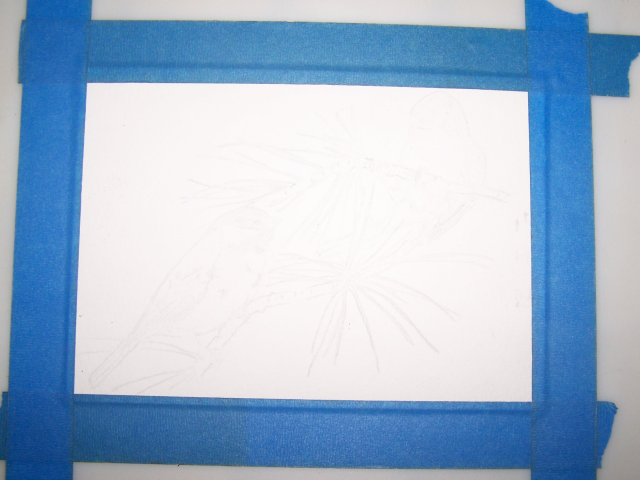 This part's gonna be tricky and normally I'd sharpen a colored pencil to an ultra fine point and fill it in that way. Alternatively I'd do the same with a watercolor pencil and activate the color afterwards with plain water and a narrow brush. Brush sizes start at 1 and the larger the number the larger the brush. There is also a size 0 and they even get smaller so there's a 2/0, 5/0, and so forth. As an example a 10/0 long bristled brush is small enough to dot the pupil of the eye of a 25mm miniature used for gaming. Having no brushes of any /0 variety with me, using a watercolor pencil would be the one to call for in this situation. However, having joked about suffering for art with the half inch flat brush in tight spaces previously, why stop there? Part of my 'go kit' that's always with me in my bag is the small pocket paint box like the one included in my giveaway II. With it is a small 3x5 watercolor journal and a 3x5 or 4x6 mixed media sketchbook and a pen. I also have a few brushes designed for travel use that come apart and fit inside themselves to protect the bristles and create a compact easy to carry system. Here's the brush I'll be using. It's a Da Vinchi travel brush in size 2. The pigment I'll be using for the needles is Winsor & Newton Veridian Green. GoKartz, GreySwampFox, bacpacjac and 2 others like this. And here we have the tree needles colored in. Yep went over the 'lines' a little bit but it's watercolor so it's okay. As the one doing it I can always claim that "it's supposed to be that way". 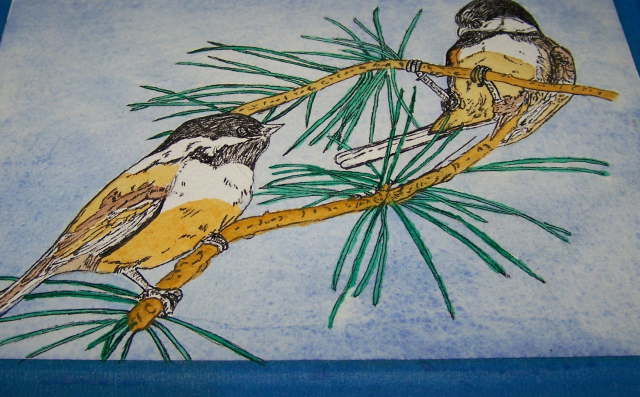 One thing you might note from earlier when I was shading the background I did "color outside the lines" in a few places on the pine needles. While in reality that wasn't deliberate I can claim such anyway and say it was to allow for some color variance in the needles. On the pallet I did lighten some of the green just a tad because nature has it's own degrees of shading. The bit of blue "over paint" doesn't detract from the end result as it provides a slight variance from one needle to the next. Done on purpose? Nope. Was I worried about it at the time? Nope on that too. I knew from experience that it would help the shading in the end so didn't let myself get worked up over it. In the IT world it's called creating an accidental feature. In the realm of art or mucking around with art tools it means there's nothing to get upset over, just put it to use later and have fun with it. Detail work with the birds and the tree branches are coming up next so let's let this dry some so my big mitts don't smear anything. happywanderer, GoKartz, GreySwampFox and 6 others like this. GreySwampFox, bacpacjac, OldMan and 1 other person like this. Thank you!! Since the only video camera I have is my phone and no tripod for it (it has no set screw for tripod mounting) I wish I could have captured this on video. Even more hilarious would be the blooper real of the video camera on me while trying to hold the camera in one hand while painting with the other. I'm ambidextrous but that was very hard and thus I only posting the pics of the work after the fact. 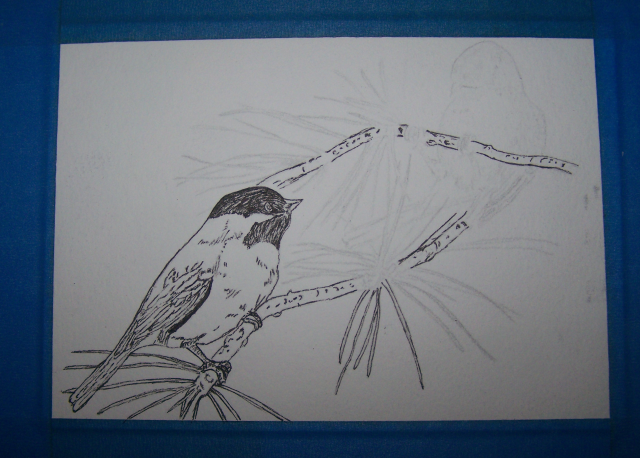 Switched to a normal number 3 brush for the branches and the birds. First up is some yellow ochre for the branches to establish a base color. How much of that will remain when complete is something we'll have to discover together later on. Let's get started with the yellow ochre now that the paper is dry again. 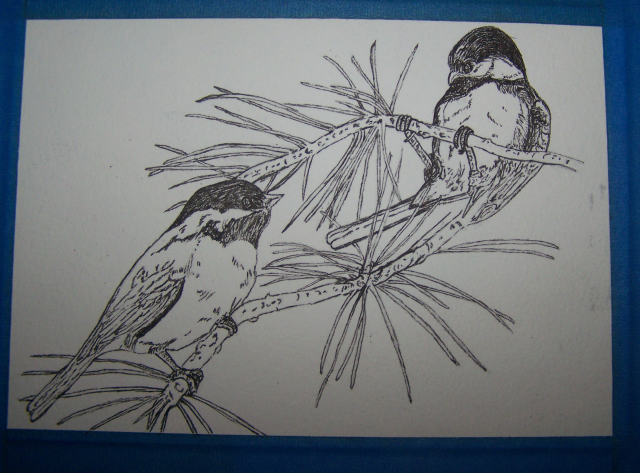 Please take a look at the bird in the upper portion of the drawing. The lower point of the foremost wing was originally drawn to display some movement and the branch coming up underneath it. At this point it looks off to me so I've got some decisions to make on it. We'll see about that but I just don't like it the way it is. 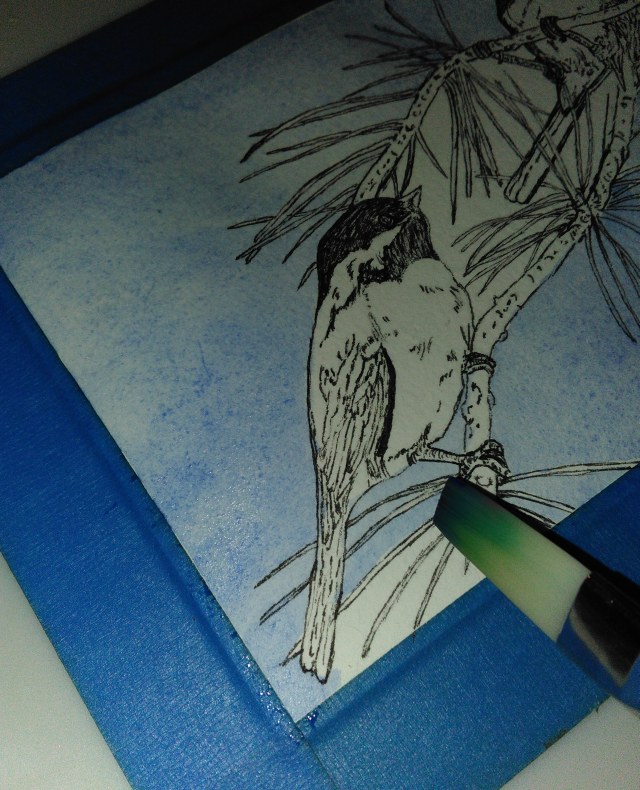 Next up is adding some pigment to the birds themselves and then figure out what's to be done with that whole branch & feather thing. happywanderer, GoKartz, GreySwampFox and 5 others like this. Okay so a few not so good images while trying to paint and photograph at the same time so this next one will show a few things added. I used the raw sienna for the light undercoating of the birds and on portions of the rest of the body. 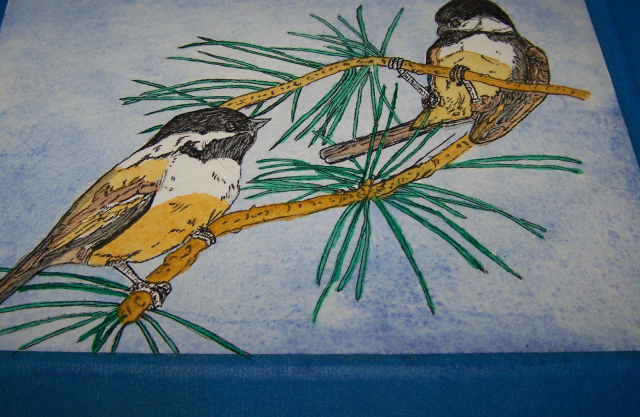 Chickadees seem to vary exactly how their plumage is pigmented from one to the next so deciding on how these two should be filled in was fun. After the lighter shade using raw sienna we move to some burnt umber for a bit of brown in light and darker. happywanderer, GoKartz, GreySwampFox and 4 others like this. Hey folks! Remember the image of the paint pallet in post 24? Here's where some of that mixing goes into play. I combined ultramarine blue and sepia to create a grayish brown in a slightly varied hue to fill in the darker parts of the plumage. 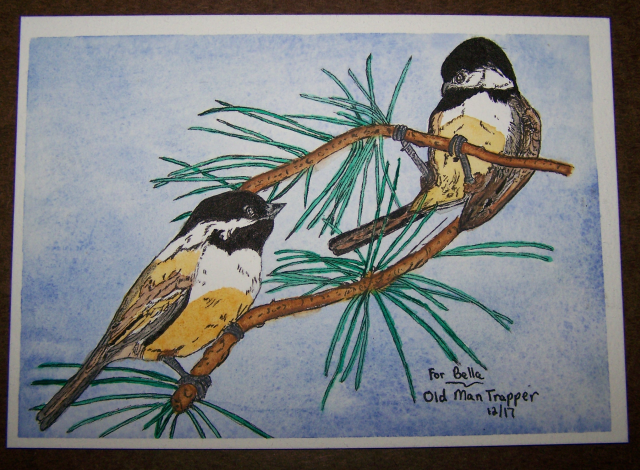 I spent a lot of time looking through paintings and photographs of chickadees before starting this and they're all somewhat different - ranging from blacks to blue gray to browns so I combined a little of the northern black capped variety with the fairly common brownish oriented ones in my area. Hope you like it!! Yep, that wing issue is not having the effect I'd originally intended. Time to take up the uniball micro pen and make a few changes. Back in a while folks while the rest of this dries. happywanderer, GoKartz, bacpacjac and 7 others like this. I've got to interject one thing here, and that's my praise for the Uniball pens. Their so called super ink is waterproof and the pens, especially the Uniball Deluxe and Signo 207 models are very smooth. They're pretty close to the sketching quality of expensive drawing pens but you can use them to write notes with and likely won't cry if one gets lost. So, with the trusty micro point 207 the wing issue is looking better. I closed up the gap there and made the wing "whole". About a minute later I added in some color from the previously mixed pigments. Now after letting that dry a bit it'll be time to move on to some more mixed media for some fun. NWPrimate and OldMan like this. We're getting into the home stretch so after all this prior discussion about mixed media, what say we get into something in addition to watercolor and ink? First up, some Derwent watercolor pencils for a few detail bits. Since the Derwent and Prismacolor watercolor pencils share the same zip up pencil case the Prismacolors got together and demanded they be included too, so here's their representative for this phase of the sketch. Once the pencil is down, I'll be using water brushes to activate the pencil pigments. For this I'll be using the same type of waterbrush as was included in my giveaway - Derwent water brushes #2 and #1 (Sorry, no image of the #1 but it's a much thinner, narrower tip than the one shown). I'll mostly be using the #2 but will also use the #1 in tight spots. Thank you Chris! Very much appreciated! Pastor Chris and NWPrimate like this. Here we have the watercolor pencil down into it's spots. The yellow ochre previously applied to the branch areas was intended as an undercoating so that it would show a little bit with some darker browns over it. Nature gives us very little in solid colors especially for trees so I wanted to try and show that in this sketch. The pigments in the watercolor pencil were a bit darker than I'd wanted though but not a problem. We'll be using the waterbrush to not only activate the pigments but also lift some of the color in random spots to make it seem a little bit more natural. Inspiring thread. 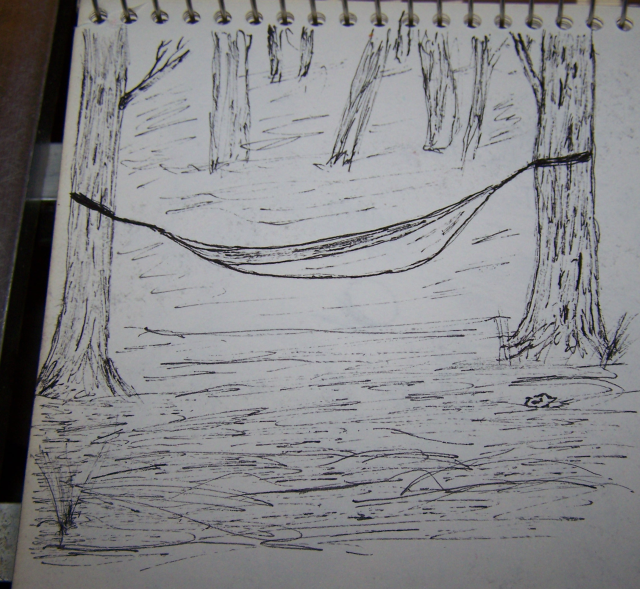 I am not an artist in any sense but enjoy “sketching” but not nearly as refined as your outcome. If trapped in a meeting, classroom or some other stationary position I can not get out of, I will incessantly doodle. Camping trips, outdoor scenes, anything that comes to mind. If I have a project in mind (right now I am setting up a little pot bellied stove for a tent stove) I will doodle out what accouterments I need to make and what I hope the end result should look like. I will sometimes build it on paper using sketching the parts in sequential order. It helps me organize things in my brain and I have a plan (no doubt only I could follow) as an end result. Please keep posting your work. The water pens were very interesting. Time is running short for today so only one more pic for the moment. I used the water brush by squeezing the transparent barrel which sends water down through the nylon bristles much like a fountain pen sends ink to the nib. As expected after the color was down it left me with more dark than light and I wanted a bit more of the undercoat from earlier to show through. Using a paper towel I squeezed more water through the brush tip and wiped it against the paper towel (sliding the brush backwards across the paper towel to keep the point intact). Then with the surface of the paper still wet I gently laid the now clean and semi-dry brush into the too dark area and "lifted" the pigment off. This made for a well blended area with random light and dark areas that are still darker in the expected 'shadows' but a more natural looking branch. Same was done for the legs and some small bits of detail work on the plumage. This needs to dry and this thread is caught up to real time as far as the project goes. While it's drying I've got some work to do - where I'm staying right now at another friend's place is a guest apartment over their family's club and they have an event tonight. Part of my agreement for being here during the forays to the multitude of doctor ordered tests includes helping out during events so I must go for now. I'll be back on and off through the night using my phone instead of tablet & keyboard to respond to posts in this thread and others here and there through the night. Thank you all so much for following along with this project!!!! Thanks for posting it for us! That was amazing. GreySwampFox, Primordial and OldMan like this. Thank you!!!! This, along with commissioned work or work for sale is rather more involved than my usual sketches. When done it'll be a gift and I'm really hoping to make the Xmas mailing deadline for the post office. This from another outing that included an overnight so I added some color to the ink sketch using Crayola brand colored pencils. It's somewhat surprising to see how pink brings out the grain color of the wood. I wasn't expecting that but it was one of the few light colors I had with me at the time. happywanderer, GoKartz, GreySwampFox and 3 others like this. That was fun to watch. I may mimic your idea and do an sketch WIP on here some time too! Thank you! I hope it inspires others to post some of their work, especially sketches done in the field as the folks did in the bygone era of the past. One thing I've learned through the years is that a piece is never "finished". There simply comes a point in the work that the artist decides to stop and let go. Long ago I used to think that saying was kind of silly but over time I've realized it's true. There's always something you can do to a piece. I even sometimes, when flipping through pages of old sketchbooks, want to add on to some work I've done there. On this piece I used a Micron brush pen in black along with the Uniball micro pen to touch up a few spots and add definition in some areas. 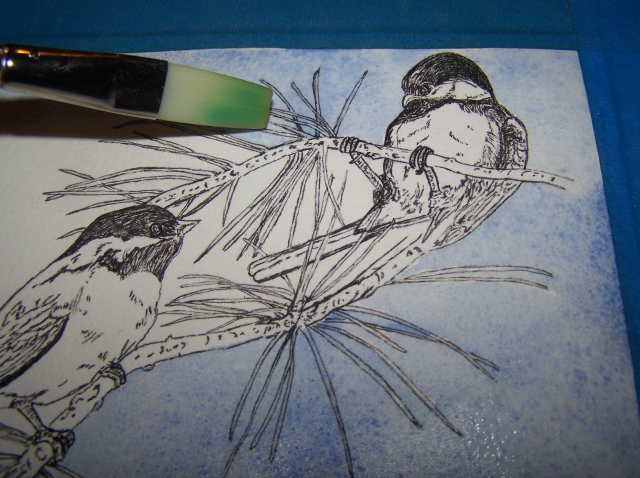 I also used a Uniball micro ultra in 0.28mm using white ink to give some better definition to the eyes of the chickadees. 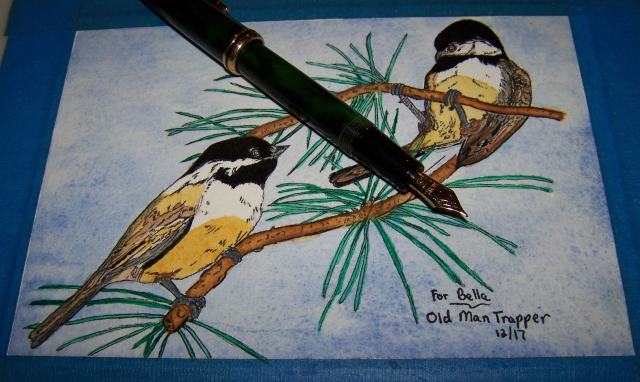 Finally, decision time, and once the decision made it's time to break out the fountain pen. Pen used is a Cross fountain pen, fine point nib, that I've had for over a decade. Ink inside is Noodlers "Heart of Darkness" black - absolute black, archival and waterproof. @bacpacjac It's on the way to you as of this afternoon. Hope you enjoy and hope that you, Bella and the family have a very good Christmas holiday. happywanderer, Luzster, GoKartz and 4 others like this. WOW! It's beautiful! Bella is going to love it! She just loves chickadees. Thank you again for thinking of her in this way. This is so special that I'm teary-eyed. I really enjoyed this thread, and watching this painting come to life. It really makes me want to practice more and get better. I think Santa is going to be delivering more art supplies next week! I'll let you know when it arrives and it's framing time! GoKartz, gohammergo, OldMan and 2 others like this. OldMan and Primordial like this. I enjoy seeing your work @OldMan, thanks for sharing with us. Right now I just figure if I can't be in nature I'll create some and it just feels good to do. I may be getting too philosophical, but I do believe that being in nature is also a state of mind. In that regard, it does allow one to feel the connection, however remote in a physical manner one is from the woods. Well, done! Loved following along with this. Very nice work @OldMan . Thank you! I'll be posting more as I can, though in the future I'm going to try to do all the images as I go then post to the thread. No pics on the few works I did this past week while in the hospital - no camera available. (Yeah I did a bad thing, trying to get acclimated to the cold and came down with a mild case of pneumonia and ended up in the hospital for a few days). Hopefully more work posted from the field soon.